To prepare the salad ingredients, wash the spinach leaves and leave them to drain in a colander. Wash the asparagus, trim it free of tough skin, then either cut it into small pieces or slice the spears into long, thin ribbons using a vegetable peeler. Put the radish and asparagus in a large bowl. Wash the pepper, remove its seeds and finely chop it. Trim the spring onions and chop them finely from bulb to tail. Add the chopped pepper and onions to the bowl. Pat the spinach leaves dry and add them to the salad ingredients along with the coriander. Toss all the ingredients to combine them. For the dressing, mix together in a small bowl the olive oil and the vinegar. Add the garlic, stirring or whisking to blend smoothly. Stir in the lime juice and zest, soy sauce and chilli pepper. Add a little salt and pepper to taste. Pour the dressing over the salad ingredients and toss well to coat the ingredients evenly. Chop the cashew nuts coarsely and either scatter them on top of the salad or offer them separately. Traditionally, Pad Thai calls to mind the fried rice noodle dishes commonly served as street food in Thailand. A typical Pad Thai also includes some simple raw ingredients – such as radish, herbs and bean sprouts, which are available on the day. This flexibility extends to the Pad Thai here. Depending on season and taste, you can vary the vegetables at will. 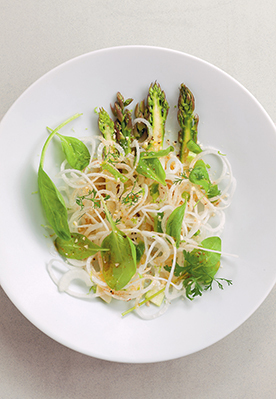 Raw grated or thinly sliced courgettes are good for this Pad Thai, as are sweet potato spaghetti strings, bean sprouts and slices of radish of all kinds. Another useful everyday option is petits pois/French beans.